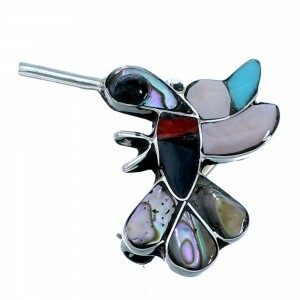 Sterling Silver, real Turquoise, Coral, Jet, Pink Shell, and Abalone Shell. (Stone variation may differ slightly). 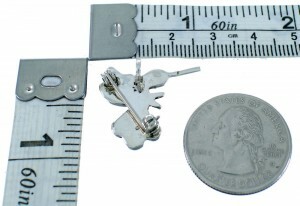 Pin pendant measures approximately 7/8" long (including bail) and 7/8" at widest point. The beautiful features in this pin pendant will make you appreciate Native American art! This piece of Native American jewelry is Zuni hand crafted by artist Diane Edaakie, out of genuine sterling silver and real multicolor inlay. 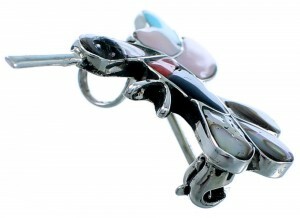 The inlay consists of: Turquoise, Coral, Jet, Pink Shell, and Abalone Shell. The inlay is gently set, creating an adorable Hummingbird design for a fantastic finish. Hummingbirds are mainly known to be defenders of their territory. Many times stronger than their small size would indicate. The pin pendant is hallmarked.